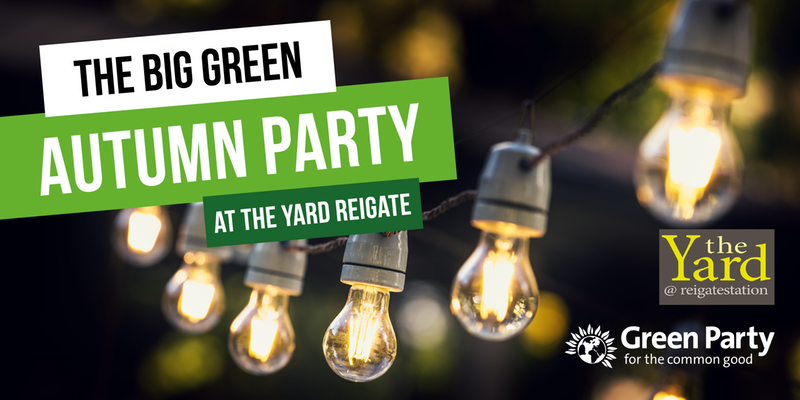 Join us on Friday 6 October for a party at Reigate’s liveliest new venue, The Yard at Reigate Station. This is a fabulously atmospheric and quirky new venue just ONE MINUTE from Reigate station. This is a chance to have fun, thank everyone who has helped with our campaigns this year, and to raise some funds to continue working for a Greener and Fairer East Surrey. *There are plenty of excellent takeaways in Reigate – including a fish and chip shop and Chinese restaurant very nearby. For vegans, Monsoon in Woodhatch deliver and are happy to prepare vegan options and Pizza Express now has a vegan cheese available.